You know how I said yesterday that I wanted to do more holo gradients in a multitude of colours, well I didn't muck around. I did one straight away in pretty shades of blue. The base for this gradient was China Glaze OMG, although it is silver, when placed next to blue polishes it really does end up looking like a very light blue. The next colour I used was also from the China Glaze OMG collection, 2NITE. 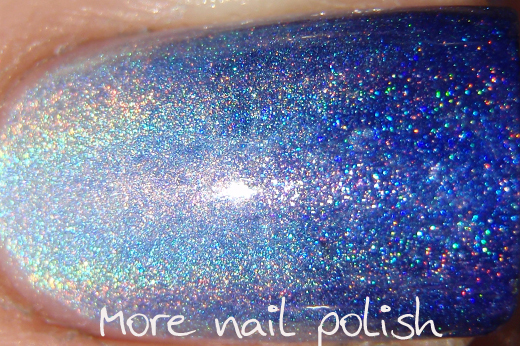 2NITE is the gorgeous cornflower blue linear holo. Next colour was OPI DS Glamour (yep I really pulled out the big guns for this mani!) Finally, the very tips had and even darker blue holo franken that I had created (and haven't even worn yet - let me know if you want to see it as a mani). 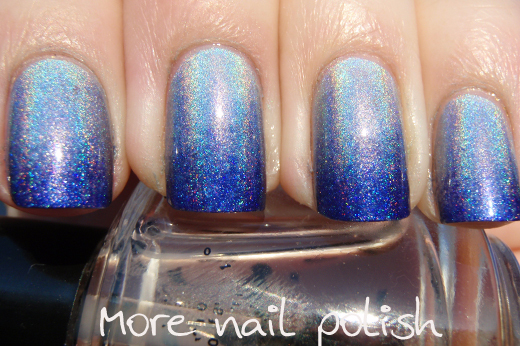 Sorry I pulled out a number of my HTF holo polishes for this mani, but it was these colours that were calling me as I was going through my swatch sticks to pick which colours went together. Hmmmm, what colour combo gradient should I try next. I could do gold through brown or pinks through to red, or lavender through to dark purple. Damn I think I will just have to do them all. YAY for not sucking at gradient manis anymore! I love that dark blue-- would love to see more manis with that! best gradient I've seen in ages!!!!!!! So blingy and pretty! Love it. 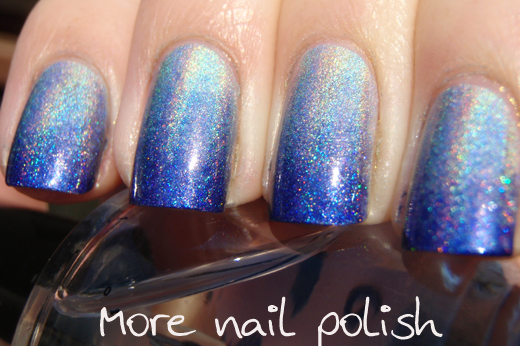 I love, love blue nail polish and this just encapsulates why! That's it. The sponges and holos are coming out tonight! That is freaking awesome! I love it! Reminds me of the ocean when the colour darken as it get deeper. You gotta do red/pink next! Wow wow... so stunning. You definitely has mastered the art of doing gradient!! Very nice!! I think a red gradient and a purple gradient would both be lovely. This is absolutely stunning. I'd love to see the franken. Beautiful! Please do show a full mani of your polish! It looks so pretty! This blue is great! Wow! I vote for a PURPLE holo one next!! Looks lovely! Yes pls show us your dark blue franken. 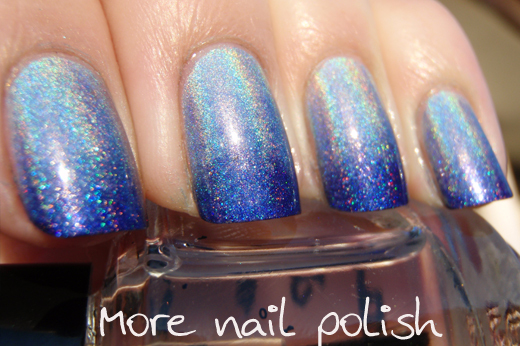 And I vote purple gradient holo for next time too:). Has anyone done a duochromes gradient yet??? Duochrome gradient - challenge accepted! Ozotic 761 - duochrome maybe not, stamping YES! Pink holo gradient and 15 years!